Thursday’s topic:Yesterday we opened up about how diabetes can bring us down. Today let’s share what gets us through a hard day. Or more specifically, a hard diabetes day. Is there something positive you tell yourself? Are there mantras that you fall back on to get you through? Is there something specific you do when your mood needs a boost? Maybe we’ve done that and we can help others do it too? From day one – okay it was probably more like day 101 – we tried to get Amy to be proud of her diabetes and not let it stop her achieving whatever she wanted. It’s a bold statement to make and one that on some days seems a mega-distance away but on the whole it’s achievable and spurs her and us on to do things that we probably wouldn’t have done if she’d never been diagnosed. It was around day 101 that we started planning our month long backpacking trip to India, something which made us very nervous – because of Diabetes, not India – but something which made us feel much stronger upon our return. Whenever I see photos of that trip it reminds me what a leap of faith it was, how we dealt with it and the sense of achievement we got from it. On top of that it was a bloody great holiday. On Saturday at a JDRF Discovery Day in Reading there was a talk by Gavin Griffiths (aka ‘Diathlete’) who runs ultra-marathons without letting Type 1 Diabetes stop him. He started by asking the audience whether they saw Type 1 as a good thing. No-one held up their hand, although I raised mine halfway for a second before putting it down. Of course I couldn’t feel that it’s totally a good thing, to see what Amy has to go through, but I truly believe we’re all better people for it. Gavin has showed that with the right preparation and training it’s possible for someone with Type 1 to running the length of Great Britain (900 miles!). Taking part in Gav’s GBR30/30 challenge made Amy even more determined to kick diabetes’ arse and it increased her advocacy for Diabetes. I see this in effect whenever we go to a diabetes event and someone sees her pump, which happened like clockwork at the JDRF event last Saturday. Amy had 6 or 7 adults and children all listening to every word she said as she described how having the pump has made life so much better for her and why it’s so ‘awesome’. So our mantras could be that ‘diabetes will not stop us’ and ‘we are stronger now than before’. Remembering the good things we’ve done certainly helps when feeling down a bit. But those mantras are no good when you’ve just had enough. Luckily last July we attended a great event named ‘Greater Minds Inspire‘, organised by Zoe and Hedgie Pricks Diabetes, which had many inspirational people with Type 1 each talking about their achievements. Every one of them was brilliant and Amy certainly started to see that she needn’t stop doing things because of having Type 1. But it was a video from Joe Solowiejczyk which was shown at the event that I remember when things are getting a bit much I remind myself of what he said, especially about meltdowns (about 1 minute in). I really like the bit about planning to have a meltdown day, seems like a thing we should plan too. We let Amy have food-meltdown-days when she has whatever she wants and we deal with any glucose level issues later. She still carb counts during these days but with so many boluses and the stacking of insulin things inevitably go badly. But within 24 hours any ‘bad’ levels are forgotten and all she can remember is that she had a cracking food day. On World Diabetes Day 2012 our new blog, Circles of Blue, went live. A year of dealing with diabetes proactively. A year of diabetes advocacy. 1. To revolve rapidly about a center or an axis. The blog was officially released on World Diabetes Day 2012 although I let everyone have a preview of it a few hours before that day dawned. Since then we’ve written 70 posts over many subjects and there’s now multiple series covering diagnosis, getting an insulin pump and travelling to India with Type 1. It’s fair to say I’ve been blown away to how it’s all been received, not just by the #DOC (Diabetes Online Community) but by the thousands of individuals who’ve happened to find an article of use to them thanks to Mr Google. It pleases me to see that people have reached my blog after search for things like ‘can a diabetic travel to India?’ (answer:yes) and ‘can a person with diabetes get a fast pass at Alton Towers?’ (answer:yes). Well, actually it hasn’t been a whole year, most of the reflecting was done in November and December when Amy, Jane and I wrote our diagnosis stories – full series of articles is here. Occasionally I try to re-read them but I rarely get to finish them. One of the most read areas of the blog is the series about travelling to India with Type 1 Diabetes with the top page of choice being Cooling Insulin with Frio Wallets. I really enjoyed re-working my original blog about that trip – Monsoon Meandering – reflecting on the epic trip it was and making it useful for any people with diabetes who are thinking about travelling there. This time last year we knew very little about diabetes, we just coped with it on a day-to-day basis. Amy had just got an Aviva Expert meter which made life so much easier that I started asking the #DOC about insulin pumps. It took a while to get Amy interested, and further time for her to not faint whenever they were mentioned, but in March 2013 Amy decided she wanted a pump and on the morning of the 20th June she took her last scheduled injection and starting pumping a few hours later – it’s changed her life in so many ways. Now, we’re looking into CGM (Continuous Glucose Monitoring) and hope that early next year Amy will starting using that. All of this learning wouldn’t have been so easy to obtain without my friends from the #DOC, so once again I thank you all for that. Starting in April we met our first two people from the Diabetes Online Community (#DOC) – Laura and Anna, who gave Amy a demo of their pumps. A few days later We went to our first official event the JDRF Discovery Day in Bristol; the Portsmouth “SweetMeet”; the JDRF Discovery Day in Dorset; the DRWF Wellness Day; the Greater Minds Inspire event; the Diabetes UK Big Event; the Bristol JDRF Walk to Cure. In May we took part in Gavin Griffiths’ GBR30/30 Challenge, with Amy cycling 30 miles in one day and ending it with a run up a big hill carrying Gav’s Olympic Torch. At the end of June we had a great two days in Alton Towers with Derek, Clare and Chloe, meeting other #DOC people Philippa and Vanessa. Since April I’ve met with around 40 – forty! – people I know from the #DOC and more importantly Amy has met some other kids with Type 1 Diabetes; they’re sure to be friends for some time. I’m halfway through becoming a Peer Supporter for Diabetes UK, where I’ll man a phone line for a few hours a week, helping people with any type of diabetes. I’m excited but also nervous about this opportunity as I know I might not have the answers they need but hopefully I can help them. Earlier this year I was asked by a neighbouring area’s diabetes special nurse to introduce parents of newly diagnosed children to the benefits of using Social Media for diabetes. I ended up creating a leaflet entitled ‘How social media helps us with Type 1 Diabetes’ which has been well received by many, be they health care professionals, newly diagnosed people/parents as well as the diabetes community at large. I’ve been so grateful to the endless retweets, posts and linking done by others in getting this leaflet out there and feel sure it’s got to many of the right people. Whilst writing this article a new tweet flashed up on my screen. I was amazed at its content and I couldn’t be prouder than to have a leading, respected Doctor mention this blog. This article is about my involvement with Gav’s challenge, where I cycled next to him during the last four days of his challenge, whilst he ran 30 miles or more each day for JDRF and DiabetesUK. If you’re expecting to find out about how Gav got on with his diabetes or running you’re going to be disappointed, you’ll have to wait and buy the book or attend one of his talks. Sorry but his tale is his to tell, not mine. Today’s route was going to be a tough one, at least 35 miles and having a 500ft hill towards the end. Early on whilst planning this route I tried to convince Gav to start from somewhere further south, maybe Portreath or the Hell’s Mouth Cafe, so as to shorten the distance and make it easier on himself. Gav was having none of my advice and replied to one email with “If I’ve made it that far on the GBR30/30 then nothing will stop me, I will conquer any hills and any distance”…or something like that. I felt for Matthew (Wood), Gav’s friend who ran with him on day one of the challenge starting at John O’ Groats; I don’t think he knew anything about this; I wasn’t sure how he’d feel about this. I knew Matthew had completed marathons but 35 milers, up big hills. I decided my best policy was to keep quiet about the route as Matthew followed me on Twitter. Personally, I was never going to start from St Agnes as I was camping down near Leedstown, near Hayle, so I’d always planned to start from me, which meant I’d accompany Gav and Matthew for the last 20 miles. Waking up to a glorious sunny day at the campsite my family and I chilled out around the pool, before I headed of to meet Gav and Mat shortly after lunch. In a way I felt a little guilty about this but in honestly laying by the pool felt great. After doing over 80 miles on my bike so far I, or more to the point my bottom, was glad of the break. I was starting to feel nervous, a strange feeling that I’d not had on any of the previous days. I knew why: I’m no cyclist or athlete and I really didn’t want to muck up Gav’s big day by being too slow etc.. It was stupid really, I knew it was but I couldn’t do anything about it. Jane drove me and my bike to the meeting point as we’d had no word from Gav. This was no surprise once we found out he was lost. Jane drove me up country lane after country lane trying to find the missing runners but we never did find them, so we went back to the meet point and eventually Gav and Matthew turned up, looking pretty fresh considering they’d already run about 20 miles. Setting off from Hayle I felt supremely confident about the route: I didn’t really need a map; I consider this part of Cornwall as like a second home having spent so much time around these parts. Along the Hayle estuary, onto the A30, off to Penzance, up the hill past Drift and then Land’s End. It couldn’t have been simpler I thought, forgetting that these guys who had already run 20 miles still had 20 to go. I was on a bike and much of it was downhill, so on came the (slight) guilt again. Whilst much of it was on the A30 the route was generally beautiful, with Kites and Buzzards flying around us, sea alternating from this side to that and back again. On the A30 we stopped in a lay by for Gav to test his blood glucose. A random Land Rover pulled up and out go two people and walked over to us. It seemed a little strange at first. “Hi” they said and told us that they’d followed the GBR30/30 information on Facebook and just wanted to come and meet Gav and say hello. They lived in Truro where the female was diagnosed with Type 1 Diabetes within the last year, aged 29. She was inspired by Gav and his challenge and just wanted to say “hi”. This to me epitomises GBR30/30: to bring awareness to people diagnosed with Type 1 Diabetes so that they can see that the can achieve great things, they may need to work around/with diabetes but it need not stop them. 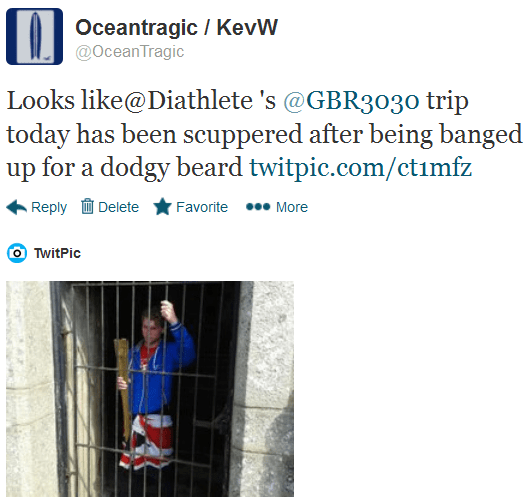 It was fitting that this encounter happened on the last day of the GBR30/30. The route I’d planned would see Gav running into Penzance around the beautiful bay, in front of the mighty St Michael’s Mount. Things changed though when Gav saw the sea and he decided to go in for a little paddle, to help soothe his legs. At Penzance we met with everyone else before the final push. Well, I say push as it was nothing, it was still TEN MILES. That’s a distance I couldn’t run in a week, let alone one day where 30 miles had already been run. Knowing how slow I am at going up hills and not wanting to slow Gav/Matthew down I put my bike on the car and got taken to the next meet point and cycled on from there. In my mind the hill was too steep for me but as I drove up it I was truly gutted I didn’t attempt it. Gav powered on towards Land’s End whilst I stayed at the back cycling behind Matthew, who had already run one of his furthest distances ever but still had 5 miles to go. I tried offering some encouragement but stayed away from the “just one more hill” comment as I could never be sure. Gav was on a mission, there was no way we were going to catch him up and I knew at this point that I wouldn’t get to see Gav finish at Land’s End, yet it didn’t matter as Matthew seemed to need my support more than Gav did at the moment. The oceans grew bigger and bigger as the horizon opened up in front of us. We could see clouds on the horizon, or was it, no, actually, that’s the Isles of Scilly. Wow! Safe in the assumption that Gav had already finished, Matthew strode on, passing the first/last pub in England, going through Sennen and finally on the straight towards the Land’s End Visitor Centre. Gav’s Dad Vince was waiting with the Olympic Torch for Matt to pick up and run with. Matt strode on, we could hear cheers getting louder and louder pulling Matthew towards the finish line. Everyone celebrated together, one big team, those that had done it, those that had supported it, all happy together. Gav looked knackered but elated, drenched in champagne. Now it was time for the photos at the signpost and this seemed to go on forever. Other kids just there for the day saw the Olympic Torch and had their pictures taken with it; anyone we told about what Gav had just completed was amazed, many saying “ran, did you say ran?” to me; the photo taking went on and on. Today was my 12 year old daughter Amy’s big day: she’d cycle her longest distance ever (27 miles); meet an inspirational athlete who, like her, has type 1 diabetes; raise lots of money for charity; run with Gavin into St Agnes carrying his Olympic Torch. My wife Jane would also be cycling with us today. Late the night before I changed the plan slightly so we’d join Gavin about 3 miles in, halfway up a 500ft hill. Why? Well to be honest I’d had enough of hills by this point and I didn’t want Amy’s big day to start with a 500ft hill climb, knackering her out with still 27 miles cycling and a run to the end with the Olympic Torch. Gav was going to depart from Bodmin Jail and although we weren’t going to cycle from there we went to see him off on his run, to then join him 3 miles later. When we got there everyone was downstairs in the old jail checking out the cells, we ventured down there too but I knew Amy wouldn’t last long, she hates things like that. Meeting Gav three miles in we parked the car in a country layby and left it there, hoping it would still be there 10 hours later. We were halfway up the hill we were trying to avoid but actually it didn’t seem to bad, probably because yesterday’s gales weren’t there any more, leaving a lovely sunny day for us to enjoy. After a couple of miles Gav’s sister Kaylie joined him running and Amy warmed to her straight away, cycling next to her for the next few miles. We passed by a road sign for a town which made me smile, especially whilst on a diabetes-related trip. For the next few miles we cycled on cycleways, the Goss Moor trail (where people on horseback rode past) and very quiet roads. The sun was shining down and I only was pleased not to need the fleece+jacket I’d worn on the previous two days. Amy and Jane were enjoying themselves too. Throughout the day Gavin’s family met us at different points, giving Gav a cheer as he neared them, motivating through the next stretch. With 6 miles or so to go we stopped at the New Inn at Goonhavern for a quick drink, meeting up with Matthew Wood and his wife Clare – Matthew ran the first day with Gav and was going to run the last too. Gav’s Dad Vince bought me a refreshing pint of shandy and as he passed it to me Gav said “right, I’m off to finish this thing”. Matthew was staying in St Agnes and told have which way to run, but it differed to the plan I’d done previously, but I hatched a plan where he’d go one way and we’d go the other and get in front of him, to be in St Agnes ready for his arrival. 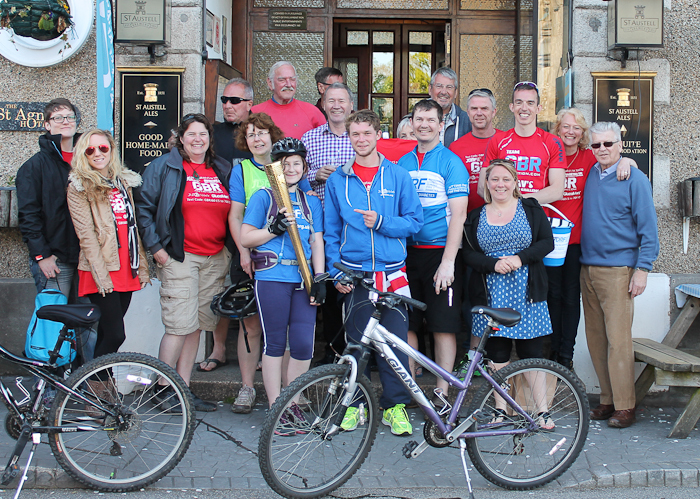 Amy would then collect the torch and run with Gav to the end point, the St Agnes Hotel. If only it had worked out like that! Leaving twenty minutes later than Gav we sped down the first hill – at 35mph for me: “woohoo…yeah…damn, that hill goes up…and up…oh kak”. The series of hills kept coming and coming, downhill then uphill and downhill again. After cycling over 23 miles already the last 4 were killers to our tired legs. This was broken by calls from Emilia, then Gav, then Vince (Gav’s Dad) then Emilia again; all asking us where we were and when we’d arrive. I had no clue. Finally, St Agnes neared and Gav met us, gave the Olympic Torch to Amy and ran up the hill with her bike, whilst Jane and I followed, slowly. Amy was elated, but sadly for Jane and myself we’d missed seeing her finish with the torch. Today would see us leave from Home Park, the home of Plymouth Football Club and attempt to make it to Bodmin, over some hills potentially worse than yesterday. At least yesterday’s hills were at the start, today they were all the way through. Today’s route on flat land was due to be 33.1 miles, or 53.3km in new money. After the longest ride I’d ever done and a couple of pints of (medicinal!) cider later I’d almost fallen asleep in my dinner, but typically didn’t sleep once in bed as my legs were shouting “you idiot, why didn’t you do a bit more cycle training for this!” at me throughout the night. They didn’t feel any better in the morning. I compared the elevation plans for yesterday and today, with dread. Gav and I set off from Plymouth Argyle FC’s ground, home park and headed towards the Tamar Bridge. As we got nearer it struck me that this was a momentous time as Gavin stepped foot into the last county in Great Britain, leaving him with around 90 miles still left. The countryside around us as we went north turned into rolling hills, often full of ripening rapeseed. The hills meant I’d lost Gavin once again as he surged forward as if they were flat. I had no idea how far behind I was but kept on going up the hills hoping to catch him up at some point before the next checkpoint at Quethiock. I reached Quethiock and found my Dad there waiting with a sandwich for my lunch, but where was Gav? He was way ahead of me, but I’d caned it down any available hills and never caught up with him. He called, he was at Blunts, a village I’d passed through 2.4 miles beforehand. He was lost and had done far too many miles already, but luckily his aunt and sister were with him. After Quethiock I pressed on but due to pretty steep hills and an horrendous gusting wind I called it a day at Liskeard, having done only 21 miles. If there’d been no wind I’m sure I would have managed the full distance. I guess I’d only set out to cycle 100 miles with Gav, that’s 25 a day and I’d already covered 57 in two days, but I was disappointed about stopping early. Dad rang me on the phone to confirm the time he was picking me up in the morning. We settled on him arriving at 5:30am, to leave at 6am on our 3 hour drive to Torquay in Devon, to meet Gav and cycle 30 odd miles next to him. It was going to be a long day. 5:30am obviously stuck in my Dad’s head, as that’s when he left his house, to drive to mine, 45 minutes away. Today’s route on flat land was due to be 33.6 miles, or 54.2km in new money. At Plainmoor, the home of Torquay Football Club, we met Gavin, his sister and his Aunt, took pictures and readied to set off. I presumed that the hilly route would be quite normal to Gavin, who’d already run through Scotland, the Cotswolds and the Mendips but he next four days turned out to be some of the hilliest routes. I was dreading it, I hate hills, which is why I’d cleverly (or not!) spent hours changing the route to minimise elevation changes and therefore hill climbs. It only took me a couple of miles to realised all this was in vain and that I should have put it a lot of hill cycle training beforehand; it was too late now. Did I say that I hate hills? Just two miles into the route came our first steep hill, a road still within the boundary of Torquay. 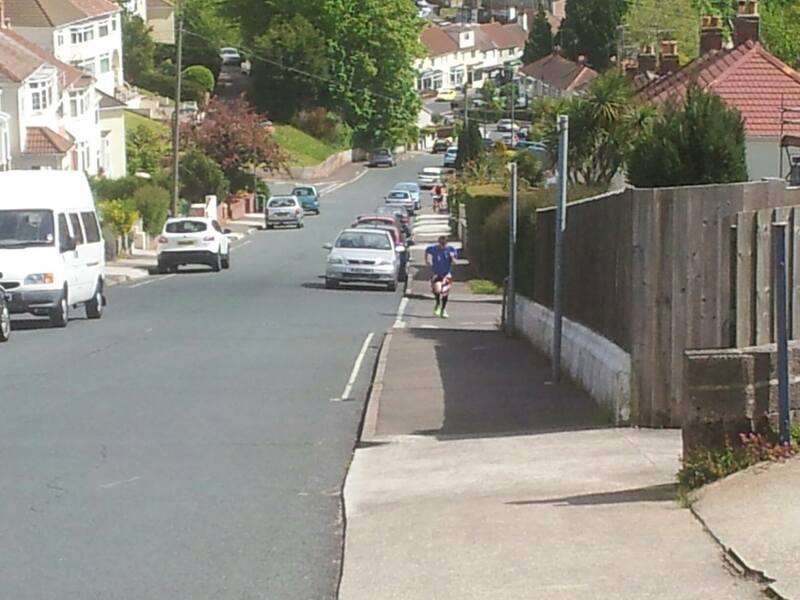 I slowed as I cycled and watched as Gav ran on, powering up the hill. Half way up my unfit legs told me to get off the bike and walk. I was disappointed but as I walked up I looked at the terracing of the houses and realised it was probably the steepest I’d ever attempted to cycle up. And just at moment Gav’s sister Kaylie caught the moment on camera. The next 3km were up hill all the way and at this point I lost Gav. Here I was, meant to be supporting someone who’d already run 780 miles and I couldn’t even keep up. I didn’t catch up with Gavin until we reached the first checkpoint, 5 miles or so in. Kaylie joined us for the run to Totnes, running alonside her brother for the next 5 miles. The lack of inclines pleased me and finally I felt like I was doing what I set out to do, thoroughly enjoying cycling through the beautiful countryside. Totnes approached, where my Dad was waiting with my first pasty of the trip, which on reflection probably wasn’t a good idea. Out of Totnes the road just went up and up, on a road not suitable for cars, or my bike, at least that’s what it felt like. Through miles and miles of countryside we went and reached the halfway point at our first pub stop, the Avon Inn at Avonwick. I looked forward to a beer until I looked at the elevation of the road that came next. I ordered a coke. The new few miles were pretty good although it was getting pretty windy and we could see rain in the distance. Gav had told me he would run at 5mph to conserve energy but at 24 miles in he was caning it at 9mph, as the photo shows. The road was getting busier, the clouds were getting darker but we pressed towards Plymouth. Through the pouring rain I cycled into Plymouth and towards the finish line. My odometer told me I’d already clocked 35 miles, the most I’d ever cycled by 10 miles…and that was on the flat. Gav and I neared the finish line and just before crossing the road I fell off my bike, with my feet still in the clips. My elbow felt like it was broken, I may have sworn a little. By the time we reached the finish the sky was turning quite blue…as was my arm. Gav ran with the torch to the finish, near the Fish on a Stick and the Mayflower steps. I was pretty relieved today and its weather and its hills was over. Gav knew the cold water in the harbour would soothe his legs so like our countrymen in 1620 he descended the Mayflower steps in search of salvation.